Description: Over 1 billion tons of food waste is disposed of globally per year, of which only around 7% gets recycled, the rest being transported to landfill which represents huge carbon emissions. 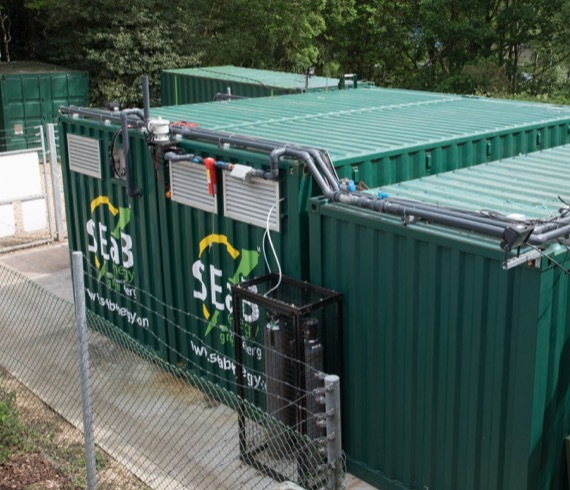 SEaB Energy designs and manufactures micro waste-to-energy plants, which use micro anaerobic digestion to extract the energy potential from food waste and manure. The technology gives a strong incentive for smaller waste producers to generate energy and income from food waste (and other bio-wastes) directly on site. Their products are being commercialized in the Netherlands, UK, France and the USA, and are applicable in food supply chain, retail & consumption locations (hotels, universities, office/business parks, sports, hospitals, airports, shopping and conference venues). 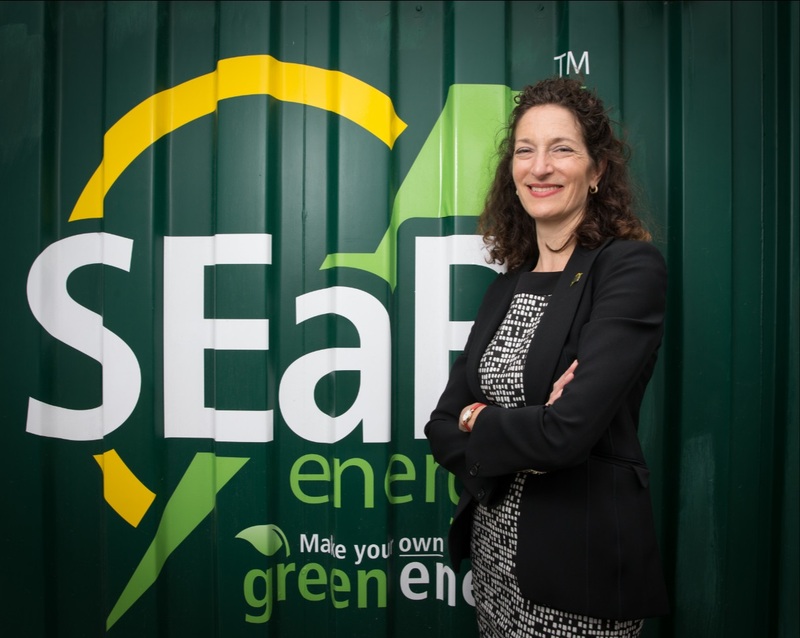 The company’s CEO Sandra Sassow has won numerous awards for SEaB Energy, which was selected as a ‘game changing’ innovation by the Launch: Beyond Waste program (NASA is among the partners of Launch). Why do we love it: Extracting energy from food & bio wastes, transportable micro digestion plants that can be used on-site in many different settings! 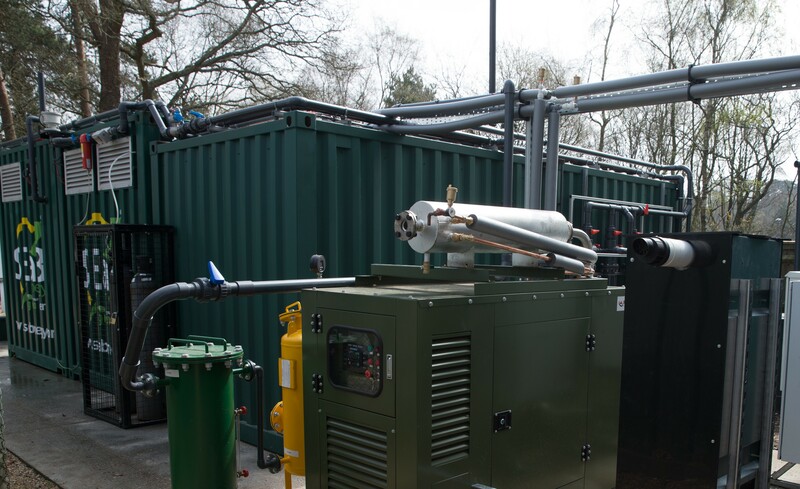 SEAB Energy has developed and commercialised a unique, patented, packaged micro power plant that turns food and organic waste into heat, electricity and water directly on the site where the waste is produced. Founded in the countryside where organic waste is all around you, the distributed use of the waste to create power seemed like a natural next step. Why move the waste and then have to transmit the power back for use. Why not just convert onsite? To be the market leader in standard onsite equipment for recycling organic waste into energy and water around the world. Livestock—mainly cattle—take the blame for nearly 15 percent of the world’s greenhouse gas emissions, according to the UN Food and Agriculture Organization. On a quiet industrial estate in Southampton, on England’s south coast, a husband-and-wife team may soon offer the unwitting ungulates a means to repair some of their environmental vandalism. These micro, mobile power plants use a natural process to transform waste into renewable energy. Anaerobic bacteria digest organic matter such as manure or food waste to produce biogas, a mixture which is primarily methane and carbon dioxide. The fuel serves as heat and electricity, while the leftover organic matter can be used as agricultural fertiliser. The idea was the brainchild of CEO Sandra Sassow, an American-born entrepreneur with a background in hi-tech and coding. The inspiration came from her husband, who also invented the technology. A founding partner of the alternative energy practice at PricewaterhouseCoopers, Nick Sassow had spent much of his career helping the world’s largest energy producers negotiate the vanguard of the alternative energy revolution since it began two decades ago. Talking to her husband, Sandra noticed that the limiting factor in all the projects that Nick and his clients were working on was the question of distribution. “They kept asking ‘how can we get the power into the grid’,” she recalled. If distribution was such an obstacle, Sandra reasoned, why not remove the grid entirely, and generate energy where it will be consumed, on site in a small-scale local power plant. Armed with this insight, the two set out to decide what energy source the plant would use. Scalable solar technology was already too advanced for a small new entrant. While marine and wind power both showed promise (wind might be the pair’s next venture), they settled on anaerobic digestion. The Muckbuster specializes in manure but also treats crop residue and certain types of food waste. The company’s second unit, the Flexibuster, is designed to handle mainly food and other organic waste, since it turns out that anaerobic digestion works even better on food waste—which is easier to find, especially in cities, and in huge supply. The UN reckons that about a third of the food produced in the world for human consumption every year—approximately 1.3 billion tonnes—gets lost or thrown away. The great availability of food waste also makes this system a powerful tool to deliver power to millions in the developing world with little or no access to the electricity grid. In Nigeria, for example, Sandra would like to put Flexibuster units on gasoline station forecourts, so that locals can trade their food waste for biogas to refill the gas containers they use to cook. Both digester units are portable, turnkey systems fitting into six-meter-long shipping containers that make them easy to move and install. They are conceived for sites generating between 200 and 1,000 tonnes of waste per year, such as villages, office buildings and military sites. Each one should eventually pay for itself in savings on energy costs, and even generate income for its owners through the electricity it creates. Across Africa, Sandra believes that the units could replace diesel generators with more cost-effective and carbon-friendly solutions. She hopes they can transform electricity generation for rural communities in the way that mobile telephones have transformed communication. In many African countries, the widespread adoption of cell phones leapfrogged entirely the establishment of a fixed line network for which there is now no need. In the same way, effective local power plants could remove the need for national electricity grids. It’s an enthralling prospect. But bringing electricity to millions of the world’s poorest using livestock manure and kitchen scraps sounds like something of a moonshot idea to investors. This, and the timing of the business’ inception, have made it tough to find financing. In 2009, asking investors to sink serious money into an alternative energy project that would take more than five years to come to market was, Sandra conceded, “a big ask.” So the £4 million (US$6.3m) she and Nick have raised to date has come from friends and family. But earlier this year the Novia platform started marketing a fully secured TTC Green Energy Bond for deploying SEaB Energy’s Flexibuster units, from which it aims to raise £10 million from institutional investors at a hefty 11 percent yield. 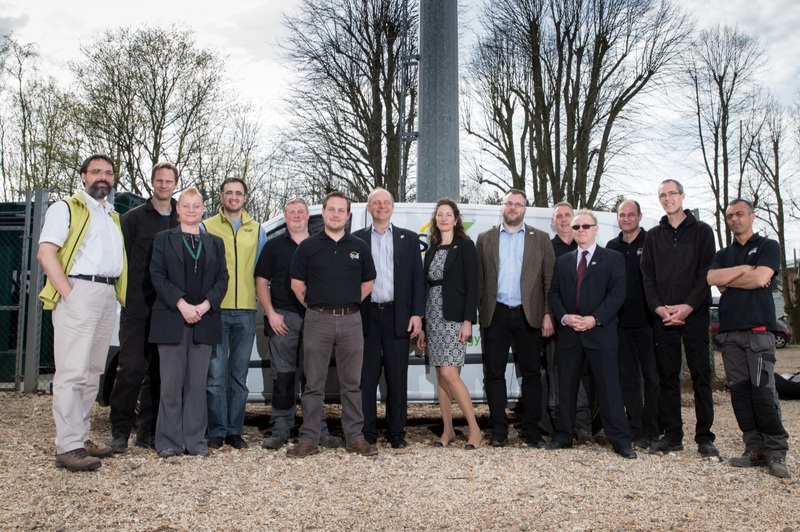 In the past few years SEaB Energy has won numerous awards and accolades, including recognition by LAUNCH: Beyond Waste as a “game-changing” initiative. Meanwhile Sandra is making promising noises about her order book. She’s reticent to disclose the number of units sold so far, but two Flexibusters were being delivered this fall to Southampton General Hospital and a developer in Northern Ireland. The company also won the opportunity to pilot a unit at London’s Canary Wharf, which it anticipates doing later this year. Sandra promises more “exciting news” to come, and investors assume this is more than hot air. Diesel : et pourquoi pas autre chose ? En Angleterre, un couple d’entrepreneurs a découvert une solution portable pour transformer déjections animales et déchets domestiques en énergie. Selon l’Organisation des Nations Unies pour l’alimentation et l’agriculture, le bétail (particulièrement les bovins), est responsable de près de 15 % des émissions de gaz à effet de serre. Au sein d’un petit parc industriel de Southampton, sur la côte sud-est de l’Angleterre, il est possible qu’un couple permettent bientôt à ces ongulés involontaires de réparer leur vandalisme environnemental. Ces micro centrales électriques mobiles utilisent un processus naturel afin de transformer les déchets en énergie renouvelable. Les bactéries anaérobiques digèrent les matières organiques comme les déjections animales ou les déchets alimentaires pour produire du biogaz, un mélange composé essentiellement de méthane et de dioxyde de carbone. Le combustible est utilisé pour la chaleur et l’électricité et les matières organiques restantes peuvent être utilisées comme engrais agricole. L’idée est née dans l’esprit du PDG de l’entreprise, Sandra Sassow, entrepreneure née aux États-Unis et forte d’une expérience dans les domaines de la haute technologie et du codage. C’est avec son mari, qui est également l’inventeur de la technologie, qu’elle a trouvé l’inspiration. Associé fondateur de PricewaterhouseCoopers, Nick Sassow a passé une grande partie de sa carrière à aider les plus grands producteurs d’énergie au monde à se placer à l’avant-garde de la révolution énergétique alternative depuis ses débuts il y a vingt ans. Sandra a rapidement remarqué que le facteur limitant dans tous les projets sur lesquels travaillaient Nick et ses clients était le problème de la distribution. « Ils ne voulaient savoir qu’une chose, comment intégrer l’alimentation au réseau, » se souvient-elle. Selon elle, si la distribution représentait un tel obstacle, pourquoi ne pas entièrement éliminer le réseau et générer l’énergie là où elle sera consommée, sur place, dans une petite centrale électrique locale. Ainsi, Sandra et Nick Sassow commencèrent à réfléchir au problème suivant : quelle source d’énergie pourrait être utilisée par la centrale. La technologie solaire évolutive était déjà bien trop avancée pour ouvrir le marché à d’autres intervenants. Les énergies marines et éoliennes se sont avérées prometteuses (l’énergie éolienne fera certainement partie de leurs futurs projets), mais ils décidèrent de s’attaquer à la digestion anaérobique. Le Muckbuster gère les déjections animales mais traite également les résidus végétaux et certains types de déchets alimentaires. La deuxième unité de l’entreprise, le Flexibuster, est conçue pour traiter essentiellement les déchets alimentaires et autres déchets organiques, la digestion anaérobique fonctionnant bien mieux avec des déchets alimentaires, largement disponibles, particulièrement dans les villes, et en grande quantité. Pour les Nations Unies, environ un tiers des aliments produits pour la consommation humaine dans le monde, soit 1,3 milliards de tonnes, est soit perdu soit gaspillé. La grande disponibilité des déchets alimentaires fait également de ce système un outil extraordinaire permettant de fournir de l’électricité à des millions de personnes n’ayant peu ou pas d’accès au réseau d’alimentation dans les pays en développement. Au Nigéria, par exemple, Sandra souhaiterait installer des Flexibuster dans des stations de distribution d’essence pour que les habitants puissent échanger leurs déchets alimentaires contre du biogaz et remplir les réservoirs de gaz qu’ils utilisent pour cuisiner. Les deux unités de digesteurs sont des systèmes portables clés en main logeant dans des containers d’expédition de six mètres de long faciles à déplacer et à installer. Ils sont conçus pour les sites générant entre 200 et 1000 tones de déchets par an, comme les villages, les immeubles de bureaux et les sites militaires. Chacun devrait finir par s’amortir grâce aux économies réalisées sur les frais d’énergie et même parvenir à générer davantage de revenus pour leurs propriétaires grâce à l’électricité qu’ils produisent. En Afrique, les unités remplaceraient les générateurs diesel avec des solutions plus économiques et écologiques. Sandra espère qu’ils pourront transformer la production électrique pour les communautés rurales de la même manière que les téléphones mobiles ont transformé la communication. Dans de nombreux pays africains, l’adoption à grande échelle des téléphones portables a rendu inutile la mise en place d’un réseau de lignes fixes. Ainsi, des centrales électriques locales efficaces pourraient éliminer le besoin de réseaux électriques nationaux. Il s’agit là d’une perspective fascinante. Mais apporter de l’électricité aux plus pauvres d’entre nous en utilisant des déchets animaux et alimentaires peut être considéré comme illusoire pour les investisseurs. C’est en raison de ce facteur et de la date de création de l’entreprise qu’il a été difficile de trouver du financement. En 2009, demander à des investisseurs d’engager de grosses sommes dans un projet d’énergie alternative nécessitant plus de cinq ans avant commercialisation, était, comme l’admet Sandra, « beaucoup demander. » C’est grâce à leurs amis et à leur famille qu’elle et son mari sont parvenus à lever 4 millions GBP (6,3 millions USD). Mais au début de cette année, la plateforme Novia a commencé à mettre sur le marché une Obligation d’énergie verte TTC entièrement sécurisée pour déployer les unités Flexibuster de SEaB Energy et dont l’objectif est d’obtenir de la part d’investisseurs institutionnels 10 millions GBP à un rendement intéressant de 11 %. Au cours des dernières années, SEaB Energy a obtenu de nombreux prix et distinctions, notamment une reconnaissance par LAUNCH : « Beyond Waste » (Au-delà des déchets), une initiative innovante. En attendant, Sandra remplit son carnet de commandes. Elle ne souhaite pas révéler le nombre d’unités vendues jusqu’à présent, mais deux Flexibusters ont été livrés cet automne au Southampton General Hospital et à un développeur d’Irlande du Nord. À la fin de l’année, l’entreprise aura également l’opportunité de piloter une unité au Canary Wharf de Londres. Sandra promet « d’excellentes nouvelles » à venir et les investisseurs font confiance au projet.